Plenty of people opt for porcelain veneers to improve the look of their teeth. Veneers are thin dental restorations placed on the top of the front teeth to generate a white smile. 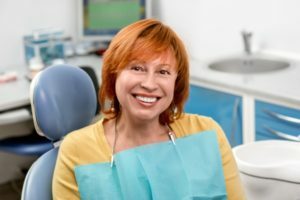 One of the top reasons people have porcelain veneers is to improve the aesthetic of stained teeth and the smile as a whole. However, there is the potential for porcelain veneers to become stained as well. Teeth are fairly porous compared to veneers, making them that much more susceptible to staining. By placing veneers on your teeth, you will find they do not stain as quickly or easily as regular teeth. Furthermore, veneers almost always have a coat of stain-resistant resin. This stain-resistant resin keeps the teeth whiter and brighter longer than regular teeth. Unfortunately, as time progresses, veneers have the potential to stain. In some cases, veneers can discolor after years of use. This happens as the resin gradually ages. The veneer aging process makes them that much prone to staining. You have the power to prevent or at least slow the staining of your porcelain veneers. Do not consume sticky or hard foods as they have the potential to sabotage the durability of the stain-resistant resin. Treat veneers like you would your actual teeth. Do not consume an abundance of sugary or acidic beverages or foods. Do not consume red wine, coffee, tea, blueberries, citrus, hot sauce or other treats that can compromise your teeth aesthetics. It is important to avoid crunchy and hard foods since they can catalyze wear and tear. Cut out all habits that have the potential to cause staining to help your veneers remain the proper shade for as long as possible. If you must have a beverage or food that is likely to stain your teeth, rinse out your mouth with water immediately after indulging. Use a straw when consuming beverages that stain so the liquid does not contact your teeth. Above all, you should avoid smoking. Smoking will discolor your veneers and sabotage all sorts of biological functions. Do not fall into the trap of using a whitening toothbrush or other products to attempt to whiten the teeth. This is a bad idea as such products will abrade your veneers, causing the resin to wear that much more. Veneers do not Have to Stain! Abide by the tips outlined above and you will find your veneers do not stain or at least stain at a much slower rate. The advice set forth above will also help keep your other teeth as visually pleasing and healthy as possible. Keep in mind your veneers are a significant investment so you should do everything you can to keep them looking fantastic. Do your part to minimize veneer staining and you will find your smile remains bright, white and lovely for years to come. Request a veneer consultation appointment here: https://robertdaddiodds.com or call Robert Daddio D.D.S. & Associates at (760) 394-3088 for an appointment in our Palm Desert dental office.